An indispensable tool for forming sushi rolls, this 9 1/2" x 9 1/2" bamboo mat ensures that you maintain even pressure from all sides of the sushi roll while rolling it! This makisu is primarily used in Japanese cooking, and features thicker bamboo than round sushi mats, with one side round and the other flat. These bamboo slats are woven together with cotton string and make for fast work when making round, square, or rectangle sushi. In addition to helping to make makizushi, this sushi mat is great at squeezing out excess water from food or shaping other soft foods. This sushi rolling mat is half the price at Webstaurantstore compared to other retailers. It has one side that is flat bamboo which makes nicer looking rolls compared to cheaper round bamboo mats. 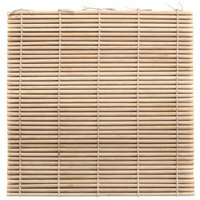 Good quality bamboo mat with square slats. Both sushi mats sold by Webstaurant Store roll sushi well, but this one feels a little more premium with its nicer sanded finish. Great quality bamboo sushi rolling mat, this is the perfect size for us, easy to clean and maintain, great quality for the price, we got a dozen. This bamboo rolling mat is easy to use and easy enough to clean. I like to have one on hand wrapped with plastic wrap for inside out rolls and one that can roll with the seaweed on the outside without creating a mess. This rolling mat works well. Fun product, beginner at sushi and was one of my first kitchen tools used to make sushi. Cleans easy, rolls up for storage. Simple to use. Ordered these as a gift for participants in a cooking class I taught that included making sushi rolls. Work great, definitely recommend the one side round, one side flat design. Great value! Ordered these for my wife. An absolute newbie and you’d never know it. The bamboo mat seeemed easy to use and the sushi rolls came out great. The few times I've made sushi from scratch, this has really come in handy. It's easy to use, and it also looks nice. Worth the money. I used to roll sushi by hand without a mat but realized that the rolling mat helps to make the roll "tighter" so that the fillings are packed into the roll more tightly than when rolled by hand. Now I can't make sushi rolls without it. A client hired us to do a live sushi bar for their party. I ordered these and our sushi chef said that he was very happy with them. Good price, good quality. This nine and a half inch by nine and a half inch Bamboo Sushi Rolling Mat is better than I had expected. It is very functional and does a great job with sushi but it is also very visually appealing. I now use the mat to showcase our wine of the week at the hostess stand. It is very pretty and I would recommend. A good value sushi mat. They don't see heavy use, but when we use them they do the job expected of them. Good quality and dependable. We are about ready to kick start our sushi making at our commercial business, and this will be our work horse! It's a great way to roll professional sushi. This bambo sushi rolling mat is excellent for creating the perfect sushi everytime. I recommend them to any master sushi chef that keeps a clean bar setup. I love the outstanding quality of this product! You will love the flat surface on one side and round on other side. The price is just great too! This was fun to use! It is difficult at first, I guess I need practice. Once I get it down I will be making these when relatives and friends come to visit. there are two types of sushi mats, one with round pieces and ones like this, which are flat on one side - these are way better both in quality generally and ability to roll sushi properly. the price here on webstaurant is insanely low. Very affordable price and worth a try. It is of good quality and has durability when well taken care of. It is easy to use. It does its job...and has for over a year now. It is not something that is grabbed daily in our kitchen but two or three times a week it gets pulled out for something and is still rocking right along. Are there better sushi mats out there? I assume there are (but up till ordering this I hadn't used one since culinary school) but unless sushi is your thing this is a great thing at a great price. Best price for the quality, try to get the somewhere else and they are usually 2.99. Websteraunt, your the best keep up the good work! This bamboo mat works really well for rolling up sushi rolls. While it might not be the top of the line as far as rollers are concerned, the value is incredible. Does the job and does it well. I've made many rolls on these mats and they're super easy to clean. Well made and a great value for the price. Inexpensive rolling mat that gets the job done. The flat side is a huge plus! I also use them also to cover bowls when I'm soaking beans or nuts, or to keep food slightly warm while I finish preparing a meal. I just ordered this precious little bamboo mat in addition to a few items needed for making sushi and I just can not wait to get started. Right size for making individual maki rolls. Clean and store easily. Each come individually packaged. Has a slightly flat side, so laying on a table and rolling is made easier than with ones that are totally rounded. An absolute recomendation for anyone who enjoys making sushi. While keeping the price low, the quality is higher than even some more expensive mats out there. Much easier than hand rolling. Very durable and flexible bamboo sushi rolling mat. Makes quick work out of rolling sushi and I was able to get the roll nice and tight. This is your basic bamboo sushi mat. It works nicely for making fresh sushi at home. Great size for a standard roll. Easy to make a variety of sushi with. I love making sushi at home and this bamboo sushi rolling mat makes it so much easier. You just put the rice and all ingredients done and it rolls it nice and tight. Well constructed bamboo material sushi making mat! Easy to roll up delicious sushi with this mat! Super affordable! Easy to clean and store for daily use!! Bamboo sushi rollers are key to have when making sushi. This roller makes nice and tight sushi. Plus they are a great steal for the price. Excellent mat for rolling sushi. Made of durable (and sustainable!) bamboo, tightly tied. This is made to last, yet available at a great price. Highly recommended. These are great for rolling sushi. So inexpensive, and they make a great and uniformed product. I actually prefer using a mat over just hand rolling. Perfect. Exactly what I was looking for. Great quality sushi mats that are absolutely wonderful for sushi making. It hasn't failed me! I'm including a picture.